09/03/15 - 1:30 - Syndicated food columnist Linda Gassenheimer, Special wine correspondent Fred Tasker and WLRN hosts Joseph Cooper and Bonnie Berman interview Michael’s Genuine and Harry’s Pizza owner, Michael Schwartz and Harry Pizzeria chef, Daniel Ramirez . Our topic: How to make a great pizza (one of America’s favorite foods) with special advice for Labor Day weekend. How about a pizza on the grill? A perfect, quick meal for end of summer dinners. 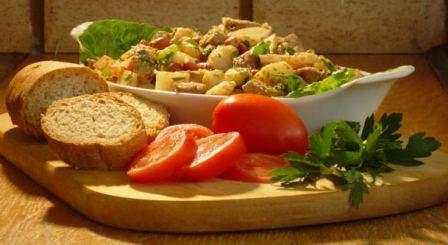 This Potato and Sausage Salad can be served warm or at room temperature. It tastes even better made a day ahead. The potatoes absorb more of the sauce. Make it in advance, pour a glass of wine and relax and enjoy. If making the salad ahead, store in a refrigerator and bring to room temperature before serving. Add the lettuce and tomatoes just before serving. Most supermarkets carry several types of low-fat turkey sausages. Look for ones that also have a low salt content and plenty of herbs or spices for flavor. Use the balsamic vinegar dressing in the recipe of buy a reduced-fat one and cut your preparation time. Preheat oven to 350 degrees. Wash potatoes, do not peel and cut into 1/2-inch pieces. Place in a medium saucepan and cover with cold water. Cover with a lid and boil 15 minutes. Meanwhile, cut the sausage into 1/2-inch pieces. Sauté in a nonstick skillet for 10 minutes or until cooked through. Whisk vinegar and mustard together in a large serving bowl. Add 2 tablespoons chicken broth and 1 tablespoon olive oil. Mix thoroughly. Add onion, salt and pepper to taste. Add beans to dressing in bowl. When potatoes are cooked, drain and add, still warm, to the bowl. Toss. Add the cooked sausage and parsley. Add more salt and pepper, if desired. Place bread in oven to warm. Wash lettuce leaves and place in a layer on serving platter. Spoon salad onto lettuce. Wash and cut tomato into thin wedges. Place around edge of platter. Sprinkle tomatoes with salt and pepper. Mix remaining chicken broth and remaining olive oil together. Spoon over tomato wedges. Serve with warm baguette. Makes 2 servings. Any type of canned beans can be used. Any low-fat sausage may be used. Place potatoes on to boil.